Pregnant women have historically chosen between two types of childbirths, natural vaginal and cesarean. But now, more mothers are opting for a combination between the two. In a jaw-dropping video recently posted to Facebook, childbirth educator Sophie Messager shared her friend’s “gorgeous gentle cesarean” in which the baby boy appears to walk himself out of the womb. Sophie says the mother’s local hospital refused to appease her nontraditional birth wishes, so she decided to switch hospitals. The mother was so grateful to meet Dr. Andy Simm at Nottingham City hospital, who supported her birth plan and agreed to film the delivery of her son in an effort to educate other health professionals about this unique type of delivery. Baby to stay on mother until she is ready to part (this took six hours), then transfer by pat sliding. The anesthetist lifted the mother up by her shoulder shoulders so that she was able to watch the birth in real time through a handheld mirror. 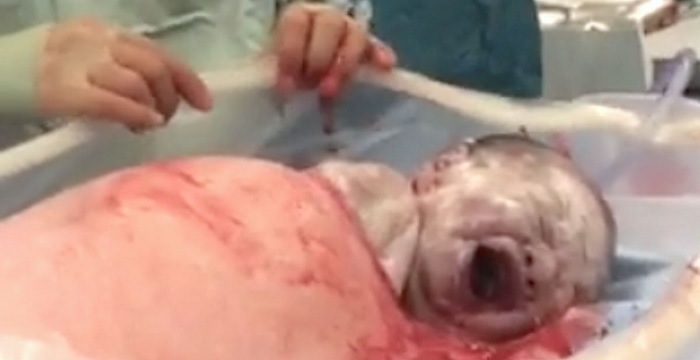 Note: This video contains graphic imagery of a childbirth. While it’s fascinating to watch, it may be too intense for some viewers.